Living Crafts has been established for over 40 years and is the largest craft show of its type in Europe. Set in the majestic grounds of Hatfield House, come and see the skills and creativity of hundreds of the UK's acclaimed Designer-Makers. Our 4th year at Living Crafts, we will be returning for our 2nd time to the Craft & Design Month marquee, sponsored by Craft & Design Magazine. Once again we will be doing live forging demonstrations and have a variety of items available to buy. New for this year, we recently collaborated with local photographer Chris Slaney, who captured "blacksmith life". The resultant images will be available to buy for the first time as prints and cards. Tickets to the event also include access to the grounds of Hatfield House, including the beautiful West Gardens. Now in its 13th year, Living Crafts for Christmas showcases the very best of contemporary British Craft, with over 180 designer-makers exhibiting, all set in the grounds of the magnificent Blenheim Palace. This will be our first year here, and we will also be doing live forgings for all to watch. Tickets to this festive event also include access to the formal gardens and parkland, and combined tickets for both the fair and palace are also available. ﻿Part of Pinner Arts Week, the Artisans' Fair showcases a wide variety of arts and crafts, all celebrating the creative skills of people in and around Pinner. This year there will be jewellery, ceramics, mosaic, glass, mixed media, paintings, gifts and delicious food as well as our blacksmith stand displaying some of our latest items. Free entry. We are very happy that we have been invited to be a part of Knowsley Flower Show in Merseyside. Now in its 18th year, it is the largest free horticultural event in the North-West, attracting up to 22,000 people. As well as our display stand with an array of items for sale, Doug will be doing live demonstrations on the forge showing his skills as an artist blacksmith. Part of The Bushey Festival, this craft fair is held within the grounds of Reveley Lodge, a large grade II listed Victorian house. 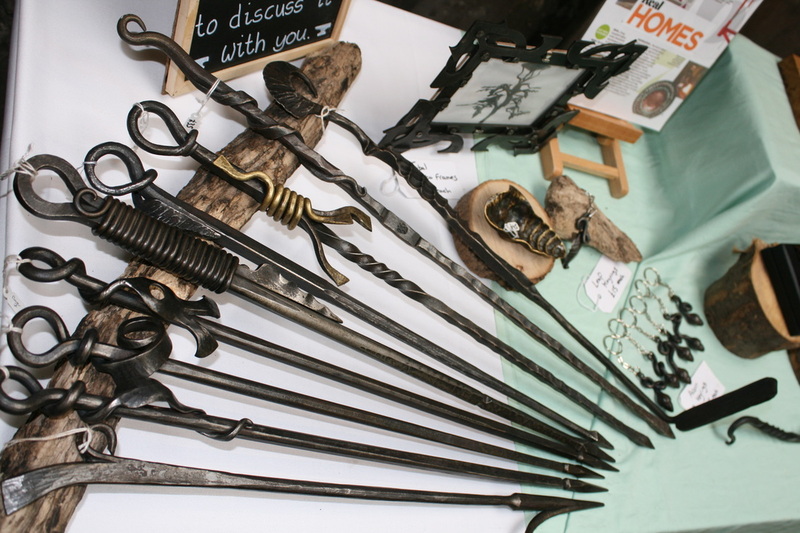 Our stand will be located in the original Victorian Stables, and we will be cold-forging just outside of these. With numerous different crafts and artists showing their wares, gorgeous mature open gardens and a vintage tea room this is an unmissable day out. We are happy to announce that we have been accepted as a selected artist for Harrow Open Studios, a group of local artists who open their studios and workshops to the public over the same weekends. You'll be able to see a diverse range of skills and artwork being made, meet the artists and purchase pieces direct from the very people who make them. We will be opening our workshop to everyone so that they can have a look around a working blacksmith's forge and watch Doug demonstrating his skills. We will also have pieces for sale and be able to take commissions. Last year we were one of only 12 artists selected to exhibit their work in the Emerging Designer-Makers Pavilion sponsored by Craft & Design Magazine. We had a fantastic time showing our work and doing demonstrations of what it takes to be an artist blacksmith. This year we have been invited back to show in the "One Year On" section. We will again be doing live forge demonstrations for everyone to watch.